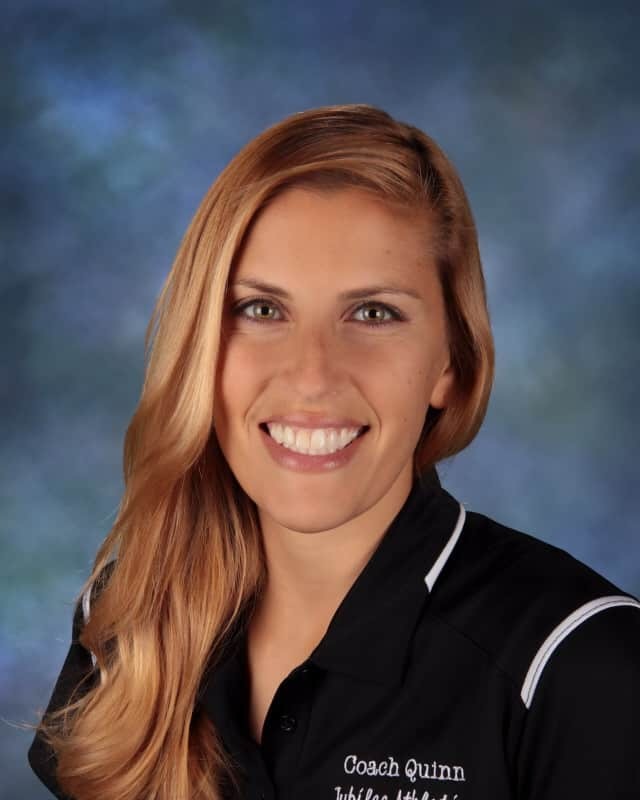 My name is Amber Quinn and I have been the Athletic Director and Physical Education Teacher here at Jubilee Christian School since 2012. I feel extremely blessed to have the opportunity to help build a program based in faith, integrity, and the pursuit of athletic and scholastic excellence through Jesus Christ. The Physical Education, After-School Sports, and Cheer Programs at Jubilee Christian School strive to be fun and enjoyable while also competitive, challenging and purposeful. The ultimate goal is to develop the character of Jesus Christ within our student-athletes, and through His grace and guidance excel athletically, academically, spiritually, personally, and socially. We believe a young athlete’s properly guided habit of diligence, perseverance, and discipline in the realm of sports and fitness transcends to all aspects of their lives and prepares them to become the Christian leaders of tomorrow. We strive to be competitors with character, demonstrating Christ-like behavior on and off the court or field. Athletes must maintain a 2.0 or better in each of their core classes and abide by Jubilee’s Code of Ethics to be eligible to play. We teach our student-athletes to compete while demonstrating integrity and poise, to love their teammates and opponents more than they love winning. We offer cheerleading to the 1st through 5th grade girls at Jubilee Christian School. Our Lady Jags Cheerleaders are taught the basics of cheerleading and dance, cheer at our home games, perform at school and community events, and compete locally throughout the school year. They are the leaders of school spirit here at Jubilee. They encourage and uplift our students with the love of Christ that dwells within them. God created us in His image, as spiritual beings in earthly vessels. By taking care of our physical bodies, we are glorifying the Lord’s intricate design. Fostering a love for fitness and health in our students is important to help them develop a balanced and fulfilling lifestyle. Physical Education encourages us to challenge our physical abilities, strive for excellence, learn from our weaknesses, and use our strengths to humbly glorify God. Our Kindergarten through 8th Grade Physical Education Program is based upon the California Common Core standards of Physical Education. The program blends aspects of the SPARK curriculum with the fundamentals of multiple group sports. By learning and engaging in various group sports, students at all ages and skill levels meet the standards of motor skill and movement patterns needed to perform a variety of physical activities. Students will also be able to assess and maintain a level of physical fitness to improve health and performance.